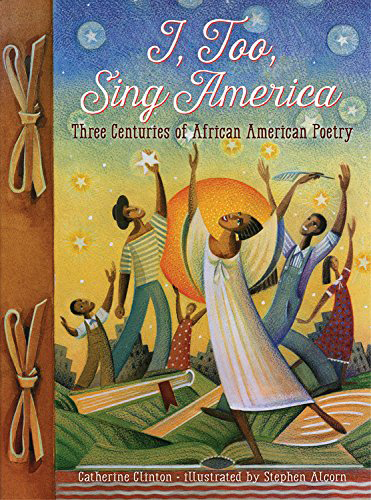 From the first known African American poet, Lucy Terry, to recent poet laureate Rita Dove, I, TOO, SING AMERICA captures the enormous talent and passion of black writers. This powerful and diverse, this unique collection spans three centuries of poetry in America as poets bare their souls, speak their minds, trace their roots, and proclaim their dreams in the thirty-six poems compiled here. The voices of Langston Hughes, Countee Cullen, W. E. B. Dubois, and Gwendolyn Brooks, among others, create an energetic blend of tone and tempo, ardor and awe. From lamentations to celebrations, these poems reveal the ironies of black America, juxtaposing themes of resistance and reconciliation, hope and despair. Each poem is further illuminated with notes, a brief biography of the poet, and stunning visual interpretations. Clinton and Alcorn have created a stirring tribute to these great poets, as well as a remarkable volume that will move any reader.